I’ve listened to Science Friday, with Ira Flatow, for many years. Its become a pleasant TGIF reminder, not to mention informative and fun. So it was with great pleasure that I got to train Ira earlier in the week with a Phantom 3 in their Midtown Manhattan office and later appeared live on-air to discuss his impressions and talk further about the growth of the drone market, their uses in education, and other drone related topics. This story running in the Washington Post is in response to a hobby scale quadcopter landing on the grounds of the White House. I’m quoted about 2/3 into the story. While this incident is likely to cause legislators to tap the brakes on UAS integration, the fact is that ship has sailed. The technology is easily accessible, and relatively reliable at the hobbyist level. The operator that performed this stunt, at 3:00a no less, is in violation of many laws and should be prosecuted in my opinion. Hopefully the GoPro camera onboard captured some pre-flight images of him or her about to be very stupid. Although a bit heavy on tales of crashing, this is a pretty balanced and positive take on our group. Fact is that we are at a place in sUAS development for civil and commercial use where manufacturing is done in factories making toys and consumer electronics. The reliability and durability, ie., the service life is short and the intended user is underserved and underestimated. In the years I’ve been involved in UAS, I’ve seen a progression from those that became interested in it as a DIY endeavor because it’s fun, to users with real problems to solve. That embrace of the technology and the realization of what is ever more possible and practical is what will drive this forward and keep it safe. Our consumer culture expects a product to work as promised with little fuss. When you pick up any smart phone, there is the expectation of functionality – it does what it says it will do. The need to become familiar with the interface is the only obstacle to successful use. Currently, carrying that expectation when it comes to consumer drones will likely cause frustration in those unaccustomed. Outside of researchers and developers, the two main user segments that have adopted drone use with open arms are those best suited for its vagaries and shortcomings. The first group is radio control (R/C) enthusiasts; these are the people that are accustomed to building and tinkering and learning from failure. The second group consists of visual artists – photographers, filmmakers. Creative people think outside of the lines and see possibilities in things others may not ever consider. Visual Artists are accustomed to trying and failing as part of their process. What the two groups have in common is a passion for learning. 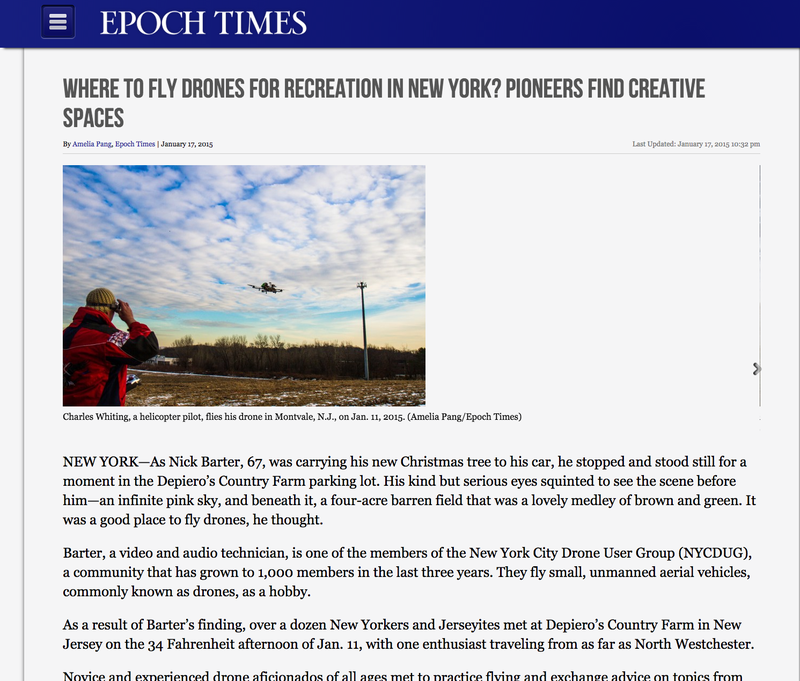 What I’ve witnessed as leader of NYCDUG is that creating and maintaining a community that shares successes and failures makes us all better at what we do with sUAS. It’s been said that the internet era has caused a lack of human connection for many, I must disagree. Without that broad reach we would not be able to pool so much experience and enable learning as we have.